A research-loving wunderkind with a nearly perfect memory, KYLIE GRIFFIN took a job managing RAY STANTZ's paranormal bookstore -- RAY'S OCCULT BOOKS -- to help pay her way through college. (It didn't help much at first, but it beat waiting tables). During her time at Ray's Occult, Kylie helped organize the store and increase profits. She was also able to earn extra money by researching older texts for the GHOSTBUSTERS when the team was busy (or Ray just couldn't remember where he'd seen something). 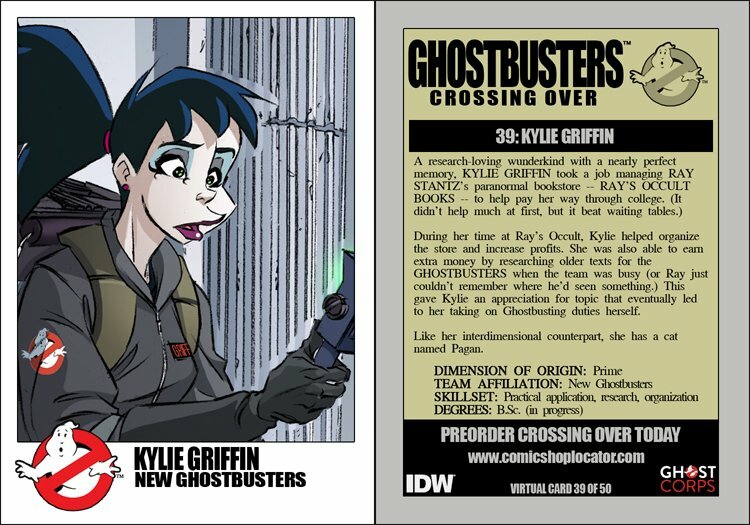 This gave Kylie an appreciation for topic that eventually led to her taking on Ghostbusting duties herself. Like her interdimensional counterpart, she has a cat named Pagan.